Windows Spotlight is an option for the lock screen background that displays different background images and occasionally offers suggestions on the lock screen. Windows Spotlight is available in all desktop editions of Windows 10. For managed devices running Windows 10 Enterprise and Windows 10 Education, enterprise administrators can configure a mobile device management (MDM) or Group Policy setting to prevent users from using the Windows Spotlight background. For managed devices running Windows 10 Pro, version 1607, administrators can disable suggestions for third party apps. In Windows 10, version 1607, the lock screen background does not display if you disable the Animate windows when minimizing and maximizing setting in This PC > Properties > Advanced system settings > Performance settings > Visual Effects, or if you enable the Group Policy setting Computer Configuration > Administrative Templates > Windows Components > Desktop Windows Manager > Do not allow windows animations. 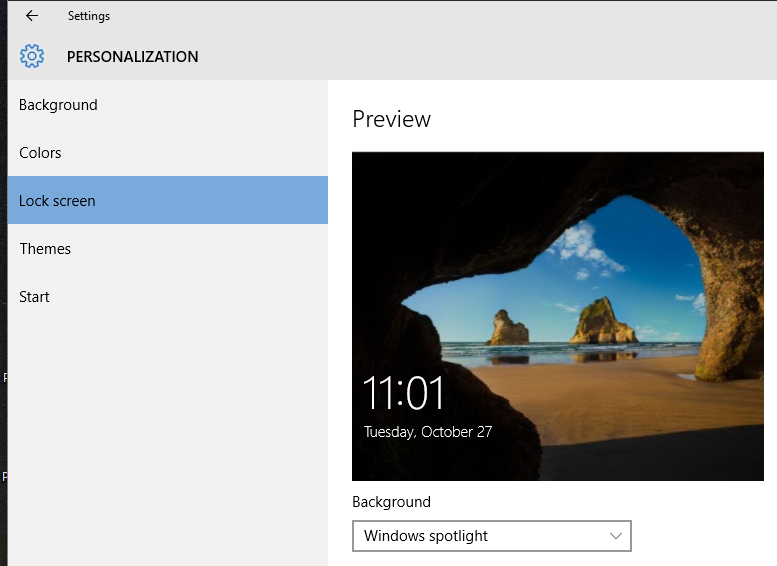 In Windows 10, version 1703, you can use the Personalization CSP settings to set lock screen and desktop background images. What does Windows Spotlight include? 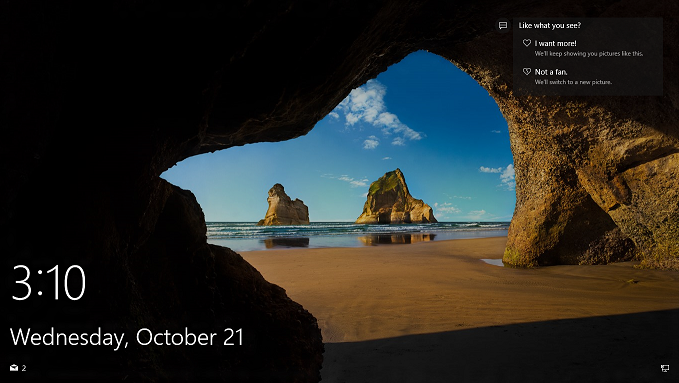 The Windows Spotlight displays a new image on the lock screen each day. The initial background image is included during installation. Additional images are downloaded on ongoing basis. The lock screen background will occasionally suggest Windows 10 features that the user hasn't tried yet, such as Snap assist. How do you turn off Windows Spotlight locally? How do you disable Windows Spotlight for managed devices? Windows Spotlight is enabled by default. Windows 10 provides Group Policy and mobile device management (MDM) settings to help you manage Windows Spotlight on enterprise computers. These policies are in the User Configuration \Policies\Administrative Templates\Windows Components\Cloud Content path in the Group Policy Management Console, and in the User Configuration \Administrative Templates\Windows Components\Cloud Content path in the Local Group Policy Editor. 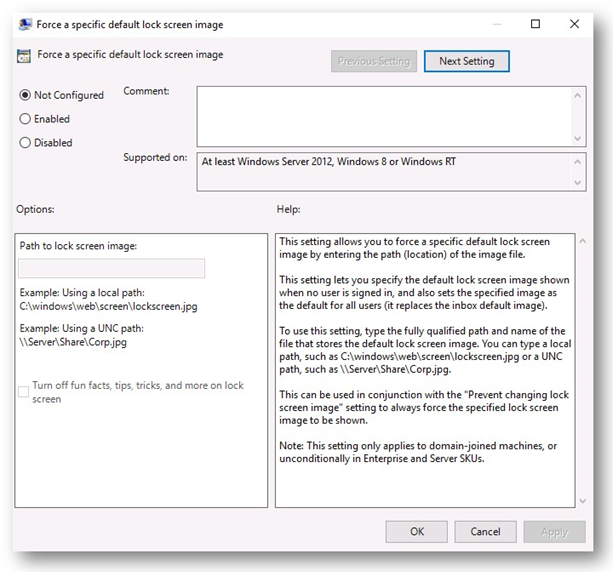 In addition to the specific policy settings for Windows Spotlight, administrators can replace Windows Spotlight with a selected image using the Group Policy setting Computer Configuration > Administrative Templates > Control Panel > Personalization > Force a specific default lock screen image (Windows 10 Enterprise and Education). If you want to use a custom lock screen image that contains text, see Resolution for custom lock screen image. Pay attention to the checkbox in Options. In addition to providing the path to the lock screen image, administrators can choose to allow or Turn off fun facts, tips, tricks, and more on lock screen. If the checkbox is not selected, users will see the lock screen image that is defined in the policy setting, and will also see occasional messages. A concern with custom lock screen images is how they will appear on different screen sizes and resolutions. Lock screen images created at other aspect ratios may scale and center unpredictably on your device when changing aspect ratios. The recommendation for custom lock screen images that include text (such as a legal statement) is to create the lock screen image in 16:9 resolution with text contained in the 4:3 region, allowing the text to remain visible at any aspect ratio.